The project was a water ingress repair project to correct the water and air leakage deficiencies and defects in the building. 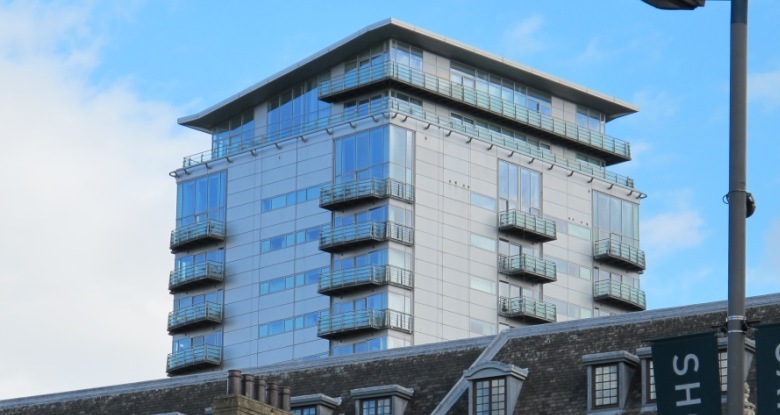 The works were predominantly external (removing existing gaskets repair/replacing cladding fixings and re-seal with silicone sealant) except for the base of the residential tower where the tower meets the podium roof and there was installed a new drainage tray behind the cladding. Also the podium roof had a coating of liquid plastic to reseal and make watertight. Access to the workface on the residential tower was achieved via the house window cleaning basket, 3No supplementary cradles and abseilers. Access to the podium was via scaffolding that was phased to avoid busy times of year for the nightclubs that occupied the ground floor. Over 100 tenants in the residential tower and 200 people occupied the offices, several of which were disgruntled because of the leaks in the building. Access to all 84 apartments at least three times was required in order to complete the works. This also included the replacing of all the balcony and terrace glazing. The site was located in Leeds city centre and as such was very busy 24hrs a day. There were 3 night club venues located in the building; access to those was maintained whilst ensuring the highest levels of safety to the public and night club patrons.